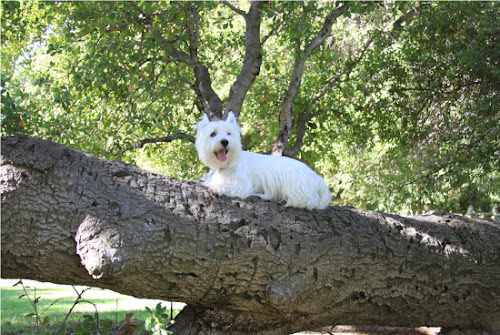 The White Dog Blog: By George, I think I have found my event!! I think you're right, Duncan, I think you're right! At LEAST a 10 I'm sure! What is with those camera people??? Don't they know a 'viral video' when they see one?? Shame. Hi Duncan, I would have given you a ten just for your cuteness! Add in the balancing and dismount and you'd would have scored a 16. Have a great day. You at you way up there, Duncan! We sure wish that we could have seen your dismount! a couple of golden treats and you'll be all set! 10? Are you sure, us white coloured dogs are pretty clever, I'm sure you could have gotten more!